Welcome aboard Regal Railways. 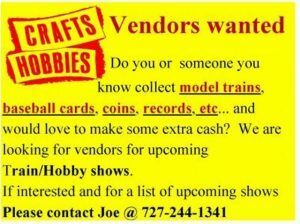 We promote Toy Train , Collectible & Hobby Shows/Sale in the Tampa Bay Area and other parts of Florida. We will have vendors with Model Trains, Collectibles, Die cast and Antiques,crafts, and other things etc. for sale. Come and bring your children. We have one or two Train Layouts at the shows. We also have a store page that you buy cookie cutters, novelties and prepaid admission to the shows. Have toys, model trains, collectibles, RC control products, comic books, baseball/trading cards memorable, star wars figures. LP’s, coins yes and crafts too.